This recipe is one I found in “Our Iowa Magazine Feb/Mar 2012". Of course, it’s one of our favorite magazines. 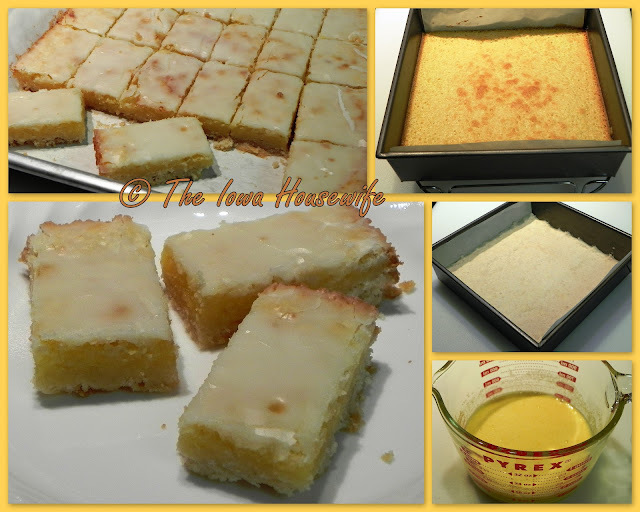 This is the absolutely best recipe I have ever found for lemon bars, and I have made it often already. I think it’s the glaze instead of powdered sugar on top. The contributor explained they are best if prepared a day ahead so lemon flavor develops and she's right. My husband thinks that's why they are so good - he says they aren't nearly as good the first day. Chill after cutting to make them easier to handle. They freeze well too. One lemon is enough if it’s a large one. If I have enough, I add any remaining lemon rind to the glaze. Preheat oven to 325°. Prepare 8" square pan, grease or grease and line with parchment paper. Combine flour, powdered sugar and salt. Cut in butter until crumbs form. Press into prepared pan and bake at 325° for 15 minutes. Meanwhile, mix the filling ingredients. Spread over crust. Bake 25 minutes longer. Cool completely. In a small bowl, mix the glaze ingredients until smooth. Spread evenly over filling. Cut into small bars - 4 x 8. Per Serving: 85 Calories; 4g Fat (37.5% calories from fat); 1g Protein; 13g Carbohydrate; trace Dietary Fiber; 22mg Cholesterol; 62mg Sodium. Exchanges: 0 Grain(Starch); 0 Lean Meat; 0 Fruit; 1/2 Fat; 1/2 Other Carbohydrates. I love lemon bars, but to this day I have not had a bar I am one hundred percent happy with. Definitely trying yours. I love lemon bars and can't wait to try your recipe. Glad to see you trying these...we think they're good; the lady who contributed the recipe won state fair ribbons with it.